That means a lot coming from you, Toad. Thank you! Absolutely wonderful, Sherry, one of my favorite shots of this icon to-date! I love it! It’s really so unique, Cheryl, I hope you do check it out and share your view of it! Yes, RH, iconic can be overused, but it does fit here. What a lovely way to think about it! Thanks, Susan. That is kind of you to say, Diane. I’m glad to share my enthusiasm for this gem. what a great post. 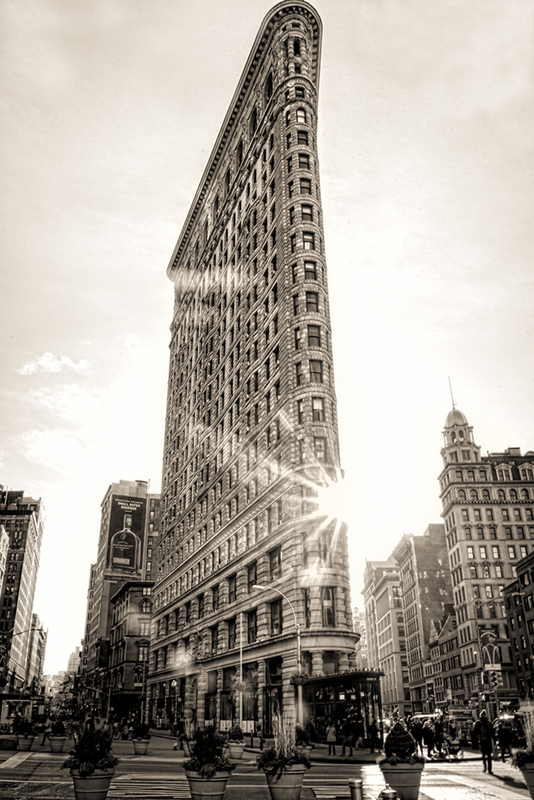 I enjoyed learning more about the Flatiron but I must also say what a fabulous image you’ve taken as well! A beautiful icon and an amazing piece of architecture. Your old friend is beaming for you here in this fabulous capture! I certainly can see the fascination with this building and without a tripod or filters I love the capture. Beautifully done!! PS they said the same thing about the Eiffel Tower when it first opened….aghast!! Such an impressive building . The light and starburst are amazing. The editing does give it that timeless feel. I have to add it to my list for my next visit. Gorgeous shot; I too loved reading about its background – your commentary brings the photo to life. Thanks, Sherry! This is such a beautiful building, and your photograph of it is wonderful, Sherry! Great shot Sherry, timeless ! Really brings out the character of the building, perfect angle and light, nice addition to your gallery. This capture gave it the perfect timeless appeal that it deserves. Thanks so much Joe. And great tip. I’ve heard of it and will add it to my list. Thanks for that insight, Elena. I always benefit from your perceptions. There was so much to say about the Flatiron I could have gone on and on, but I kept it relatively short so I could get the post up! I will share with you some of my other discoveries when we next meet. It was great to review all your Flatiron images. What’s unique about this new one is how it communicates the delicacy, almost fragility, of the structure. I especially like the sepia treatment. It underlines the building’s historical relevance. And thanks for the research too – your posts always over-deliver! The Flatiron building in NYC is one of the most beautiful old structures and I love the detail of the architecture. Across from Madison Square Park there is also a great Italian market and restaurant called Eataly. The next time you are in town I would highly recommend it Sherry 😀 Great image.